While all the ghouls and ghosts have fun during Halloween it can be a stressful time for your pets. Check out these 5 ways to keep your pets safe during Halloween so they don’t feel like a trick’s been played on them. We all love our pets dearly and would never want any harm to come their way. However, on Halloween, it’s easy to get wrapped up in all the spooky fun and not be able to keep a constant eye on our pets safety. Halloween can be one of the most stressful times of year for our pets due to all the noise, decorations, and strange-looking humans. Make it a little easier on your fur babies this year with these 5 ways to keep your pets safe during Halloween! 1. Don’t let them eat any candy. Chocolate is bad for most animals due to the caffeine-like stimulants and fat content. Xylitol, a sweetener, can cause major issues quickly in dogs. Animals can also have unknown allergies, or get sick with vomiting and diarrhea. So, be sure to keep all candy away from your animals and let them enjoy some pet treats instead. 2. Always keep an eye on them if they’re wearing a costume. We can all admit our pets look super cute in their own costumes, but most of the time they don’t enjoy them nearly as much as we do. If you want to put a costume on your pet, make sure to keep an eye on them that they aren’t chewing up pieces that could harm them if they swallow it. Be mindful of any small pieces that can become choking or digestive hazards, like bells or strings. Some pets may need time to warm up to wearing a costume. You may need to let them sniff it and slowly introduce putting it on them with positive reinforcement such as loving pets and treats over several days. 3. Keep your pets indoors and secure when handing out candy. Even the most docile and obedient pets can get scared and bolt out the door with the number of new scents, sounds, and sights seen on Halloween. If your pet normally reacts negatively to the doorbell ringing or a knock on the door, odds are Halloween is going to be stressful for them even if you’re just giving out candy. Make sure your pet is secure indoors, even if it’s in a crate or another room when handing out candy for their safety. This way you can also make sure no one antagonizes them or gives them anything they shouldn’t. Kids may mean well giving Fido a chocolate bar but not realize it’s not good for them. 4. 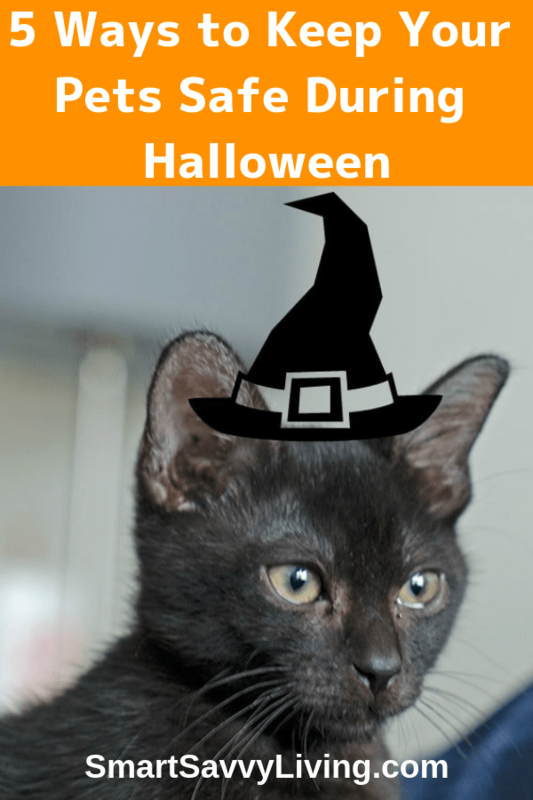 If you have a cat that goes outside, keep them inside a few days before, during and after Halloween. I’m an advocate of having all cat pets be indoors, but it’s especially important this time of year. It seems like every year I, unfortunately, read an article about a group of pranksters that think it’s fun to commit abusive, and sometimes even deadly, acts on cats around Halloween. Black or white cats are usually the most targeted, but it can happen to any cat, so please leave them indoors during Halloween week. 5. Be mindful of your Halloween decorations. Animals are curious creatures and it’s not always easy to communicate to them that something can hurt them. As such, it’s very important to be mindful of your Halloween decorations, especially when you won’t be around to keep watch. Be careful of papers and plastics that can be eaten, hanging decorations that can be seen as toys, candles with real flames that can be knocked over and cause a fire, any candy that may be in easy reach, etc. Also keep in mind that while some pumpkin may be okay for most pets, too much of anything can be a bad thing. With a few precautions, Halloween can be a fun and stress-free night for everyone.